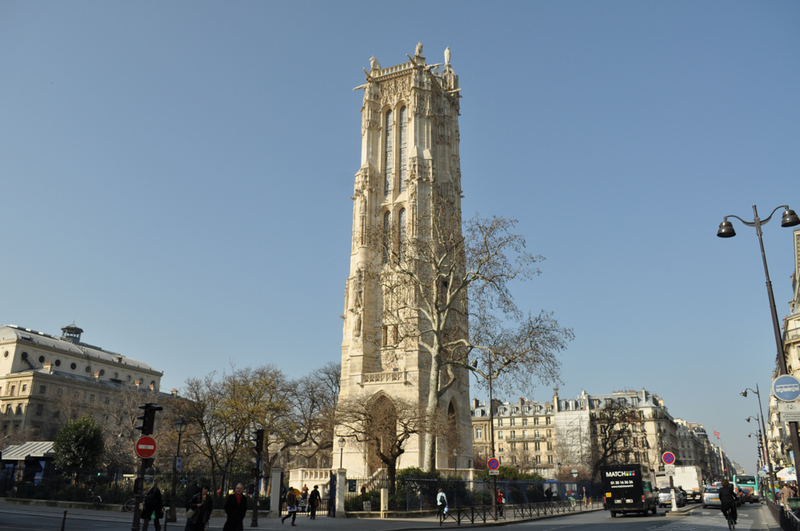 The Saint-Jacques tower is probably the oddest monument in Paris: a tower standing lost and alone in the heart of Paris. Intriguing, no? That’s why André Breton, the surrealist writer, loved this tower more than anything else in Paris. 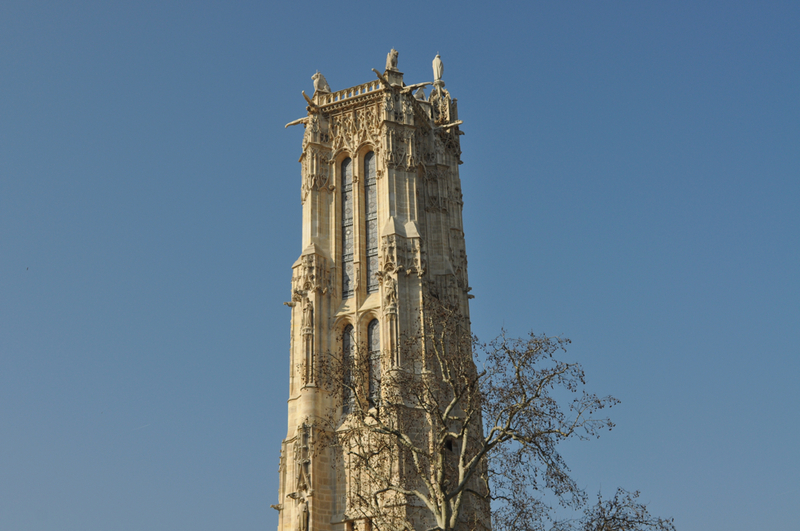 The Saint-Jacques tower? Ask the Parisians what it belonged to and most of them, I bet, will not know the answer. This curious Gothic belfry, built between 1509 and 1523, is actually the only remaining vestige of the church of Saint-Jacques-le-Majeur, called “de la Boucherie”, and destroyed during the French Revolution in 1797. The nick-name came from its wealthy patrons, the wholesale butchers from the nearby Les Halles market. This sanctuary used to be, believe it or not, the departure point of the pilgrimage route de Santiago de Compostela in the Middles Ages. At the beginning, there was no church, only a little chapel dedicated to St. Anne. But little by little it got bigger and bigger. It was the alchemist Nicolas Flamel, adored by the surrealist Breton, who commissioned a big part of the extension. In 1648, Blaise Pascal experimented here with gravity and repeated his barometric experiments he had carried out in Puy-de-Dome before. That’s why you can find a statue of the French scientist on the ground floor. 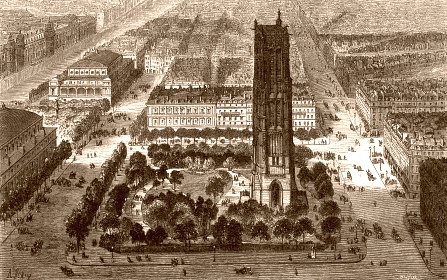 After having escaped demolition during the Revolution, the tower served as a factory for hunting ammunition, before the city of Paris purchased the tower in 1836. Today you can still admire the strange gargoyles, the eighteen statues of the saint that decorate the walls and, of course, the sculpted symbols of the four evangelists, the lion, bull, eagle and man.